This conversation on celebrating birthdays was sponsored by Baskin-Robbins. View our disclosure policy here. This past week my family got together to celebrate my mother's birthday. For dessert we decided to order an ice cream cake from Baskin-Robbins. Did you know that you can customize and order your Baskin-Robbins' ice cream cake online? It is super easy (and fun) to do. You can select the style, size, color, and flavor of your cake, as well as personalize it with a special message in your choice of color. Your cake will be ready to picked up at your local Baskin-Robbins 24 hours after ordering. We decided to order the new Baskin-Robbins' Mini Cupcake Birthday Cake for our special occasion. With its bright colors and ring of miniature cupcakes, this festive cake is the perfect choice for a birthday celebration. When we picked up our cake, we were not disappointed. It looked perfect! Personally, I couldn't wait to get my hands(or mouth rather) on those mini cupcakes, I was so curious if they were edible, and if so, what they were made out of and how they tasted. 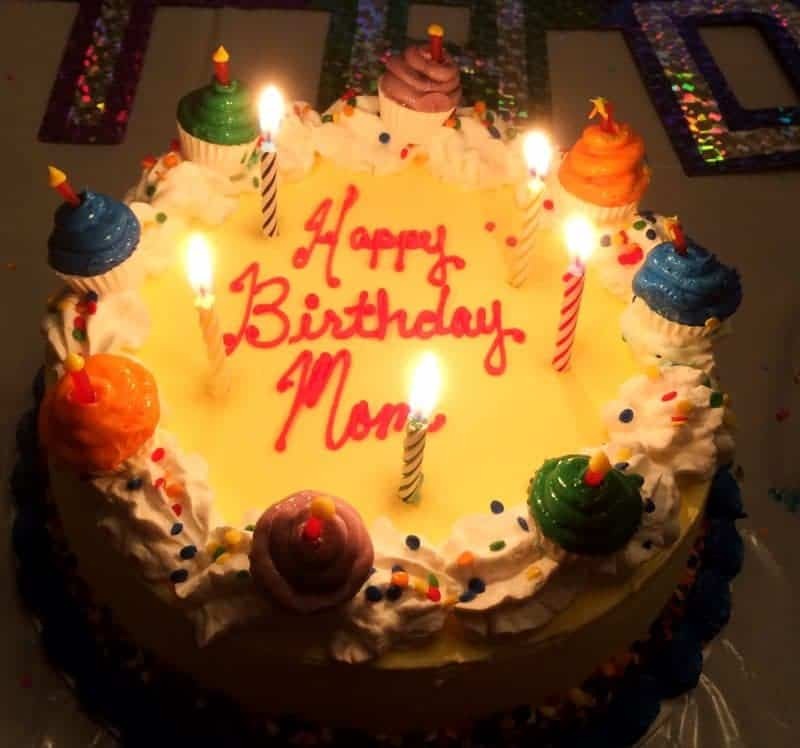 When it came time to dessert, we sang Happy Birthday and Mom blew out the candles. I eagerly sliced the cake up and served it to our guests. I even more eagerly grabbed myself a slice. It was unanimous – Baskin-Robbins' Mini Cupcake Birthday Cake was delicious. The ice cream was rich, and the icing was heavenly. Those little mini cupcakes are indeed completely edible – they are made with white chocolate, icing, and what I believe to be a small stick of licorice. 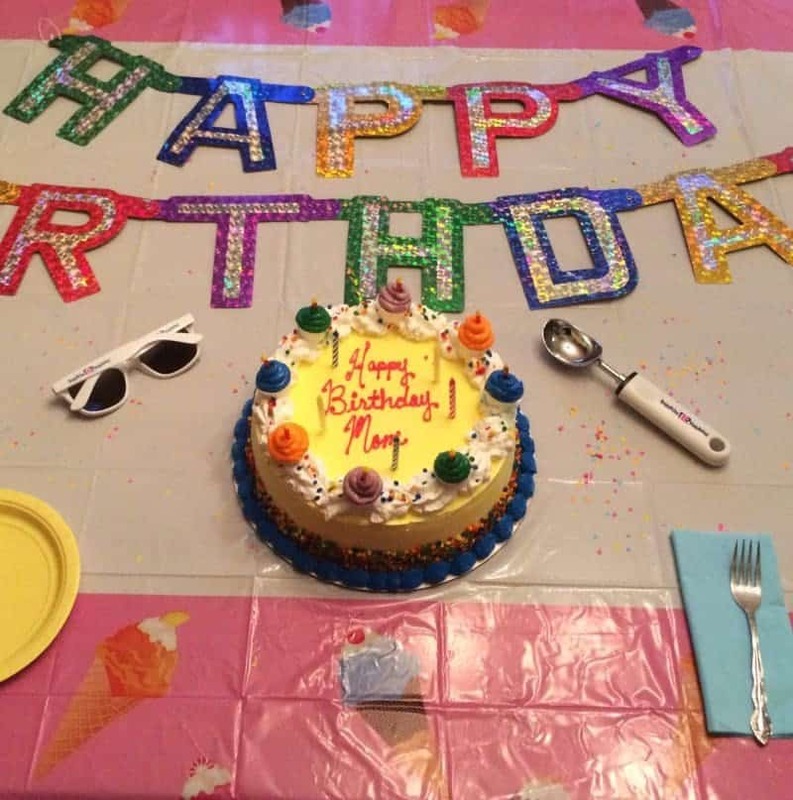 September is not only my mother's birthday, but it is also Baskin-Robbins' birthday! The ice cream shop chain is turning 70 this month, and in honor of their birthday they are giving away $31 Baskin-Robbins gift cards to 70 of their Birthday Club members. Being a Baskin-Robbins' Birthday Club member has other perks as well, like getting a free ice cream on your birthday and special deals and offers throughout the year. 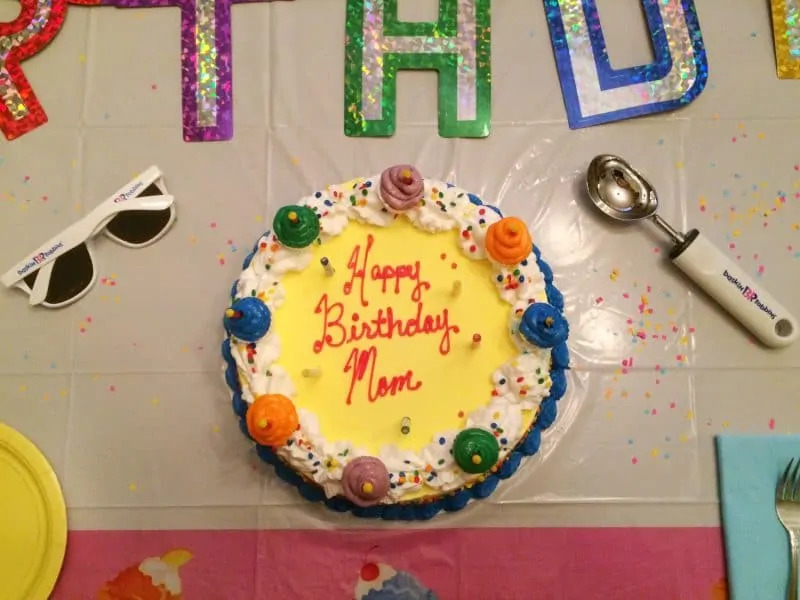 The next time you are celebrating, consider one of Baskin-Robbins' ice cream cakes. They have designs for a variety of holidays and occasions – birthdays, graduations, Easter, Valentine's Day, etc… Visit Baskin-Robbins to find your nearest location, order a cake, or sign-up for the Baskin-Robbins' Birthday Club. Very cute cake. I will have to get one of these cakes for one of my family members.